Wednesday, March 6, 2019 7:30 p.m.
Thursday, March 7, 2019 8:30 p.m.
Blick Théâtre creates theatre that juggles with reality and make-believe. Their creations without words combine puppets and humans. With extraordinary dexterity, the performers easily manipulate illusion and create mirages that blur the boundaries between reality and hallucination, between the norm and the incomprehensible. The puppets end up acting on their own and we lose any sense of who is manipulating whom. Humans and puppets play a shapeshifting game that turns our understanding of strangeness and strangers on its head. Blick Théâtre juggles with reality and make-believe, taking us on a journey into a magical, yet disconcerting world where madness (hullu in Finnish) is as frightening as it is fascinating. Based on extensive research into both mental disorders and autism, [hullu] is an invitation to let go of the familiar in order to better explore our relationships with others from an unconventional, more human point of view. 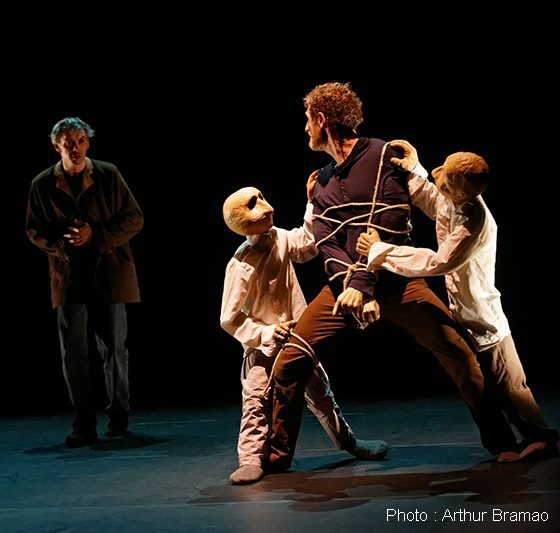 As trained theatre and circus arts performers, members of Blick Théâtre first came together in 2006, when they founded the Le Boustrophédon theatre company. The production that brought them together, Court-Miracles, has been performed more than 500 times in France, Europe and around the world, and continues to tour. Following this collaboration, Johanna Ehlert, Matthieu Siefridt and Loïc Apard continued to develop their artistic vision with [hullu] and created Blick Théâtre, with Dominique Habouzit as co-author. Their creative works deal with how we see the other and how we deal with difference, and offer a tender and non-judgmental look into human nature.